Water and moisture have traditionally been one of flooring’s greatest enemies, but at our store, that’s no longer the case. We offer you a full line of waterproof flooring in Ocoee, FL, that can give you the beauty of materials like carpet, hardwood, and vinyl even in kitchens and bathrooms. Modern-day manufacturing techniques have allowed homeowners like you more choices than ever before. Now you can have your floor be uniform throughout your whole house instead of having to choose different materials for moisture-prone spaces. Our waterproof carpet is especially innovative, as it prevents water from infiltrating to the floor beneath and is stain resistant. With protection like this, you won’t need to worry about your pet having an accident or someone spilling a drink. If it happens, just wipe or soak it up and that’s all there is to it. There’s no fear of mold or damage to the floor—a peace of mind that traditional carpets can’t give you. Now you can truly have whatever floor you want, wherever you want it. Investing in a material that’s practical should never mean living with an unsightly floor. Our waterproof luxury vinyl gives you the best of aesthetics and functionality. These floors hold up in even the dampest places and are attractive too. You can enjoy the fun of choosing between the many different colors and styles in our showroom. Some of our floors are even fabricated to resemble ceramic, natural stone, and wood. By shopping with us, you can have the floor that satisfies your preferences and performs at top-quality. There are some materials that add a lot of value to the home but are not so easy underfoot. Our waterproof vinyl flooring gives you a floor that’s beautiful, durable even in water-prone places, and softer on feet as well. Their waterproof cores keep them from degrading, expanding, or rotting, and they never let liquid into the subfloor. Even under heavy foot traffic, this floor will stay strong for you. An added benefit is that this type of floor is super easy to maintain. If it begins to get dirty, a simple mop or sweep will do the trick. You and your family can enjoy a nice new floor free of worries about its condition and with minimal cleaning to boot. 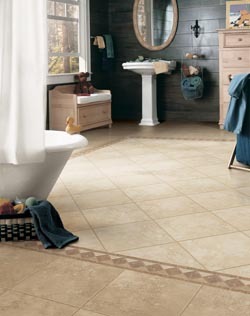 Our waterproof selections allow you to use your floors to the fullest. Contact us for a free consultation on waterproof floors. We install these floors in homes all over Ocoee, Florida, and the neighboring areas.